Prior to this novel came Best Murder in Show and Trick, or Murder? This third one is, of course, set in the run up to Christmas and the school nativity play in particular. Debbie Young has managed not only to write a wonderful novel but also the bones of a cracking nativity play. I really think she ought to write the full nativity (if she hasn’t already) and stage it! It is written from the point of view of Sophie who inherited her Aunt May’s cottage in village in the summer. She has therefore been in the village about six months and is experiencing her first village Christmas. Sophie is utterly charming and just too adorable in her naivety and insecurities but manages to deal with the unwelcome arrival of her former boyfriend Damian with grace and aplomb. The subject of this book’s mystery is the existence and identity of a new mother and the whereabouts of her baby. Do not concern yourself about the title, there is no gruesome murder in this novel. This is a warm, humorous read ideal for the Christmas period that will leave you smiling and feeling festive. When Sophie Sayers’ plans for a cosy English country Christmas are interrupted by the arrival of her ex-boyfriend, her troubles are only just beginning. Before long, the whole village stands accused of murder.Damian says he’s come to direct the village nativity play, but Sophie thinks he’s up to no good. What are those noises coming from his van? Who is the stranger lurking in the shadows? And whose baby, abandoned in the manger, disappears in plain sight? 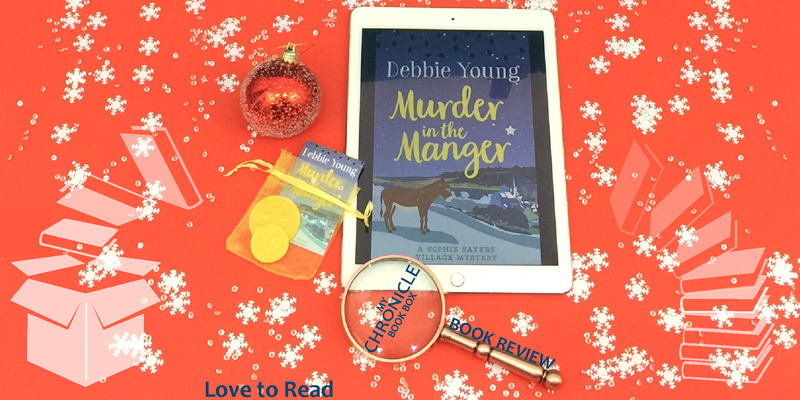 Enjoy the fun of a traditional Cotswold festive season, with echoes of Dickens’ A Christmas Carol, as Sophie seeks a happy ending for her latest village mystery – and for her new romance with charming local bookseller Hector Munro.